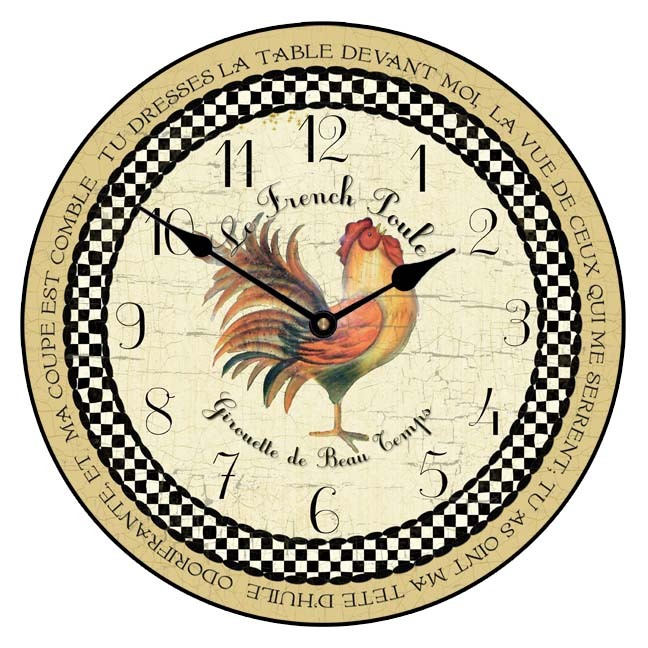 Vintage sytle Rooster Clock has a distressed tan rim has a parchment face is loaded with of details, the tall Rooster has bright hues of green, red, pinks and greens, the French writing Le French Poule means the French Chicken and this Rooster clock will look wonderful in either the kitchen or dining room. Available in sizes 12", 18". 24" 30" and now 36" in diameter this large wall clock runs on a quiet Quartz movement, one AA battery is required. 1/2" thick MDF Wood Base (industry standard is 14"). Clock hands may vary depending on clock size.